I have owned this case for over 6 months and it is available for most smartphones on the Case-Mate site. This case is not on the cheap side as cases go. 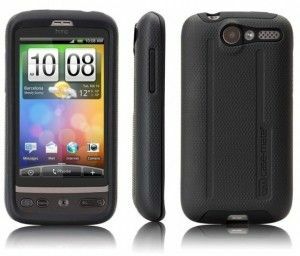 The one for the HTC Desire costs Â£24.99 from case-mate (or Â£20.95 from Amazon ) So, is it worth your money? Does it live up to its "tough" name? In short, yes and yes. The case is made up of 2 Layers. A rubbery silicone layer (which slips onto the phone with ease) and an ABS hard shell plastic which fits onto the silicone layer. The silicone layer has a lip on the front so when laying the phone face down the screen does not touch the surface. I have a tendency of not giving my phone the same care and attention after a few months as when I first got it but with this case I'm not too worried. It covers all the corners of the device with the silicone layer which absorbs any impact and shock on the phone. The added ABS shell gives it a sturdy and secure feel. I have had my phone dropped from shoulder height, flung out of my hand, dropped from my bedside table numerous times and there is no noticeable damage on the case or more importantly on the phone. However, all this does come with a couple of downfalls. There is added bulk (contrary to Case-Mateâ€™s description) and does also add some weight. So if you are a lucky owner of a new light/thin smartphone (like the Galaxy S II), and like its slim profile and feather like weight, I wouldn't recommend this case, but if you want tough protection of your new and expensive smartphone this is the case I would recommend.